Did you ever pick the crumb topping off of coffee cake to nibble on? I have – it is the best part. When I saw this recipe on Serious Eats, a love child of banana bread and coffee cake, I knew I had to try it. 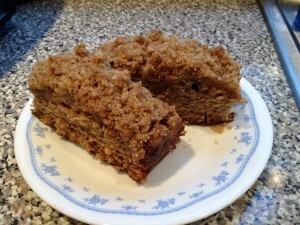 The cake was moist, had great banana flavor and the crumb topping was worthy of picking. I used the more densely packed crumb recipe and although the original recipe says to bake for 50-60, it only took 35 minutes for a toothpick to come out clean. I skipped the chocolate topping – no need to gild the lily. 1. For the crumb topping: In a medium bowl, whisk together flour, sugars and cinnamon until thoroughly combined. Drizzle melted butter over the flour mixture use a fork to incorporate and form a fine, sandy crumb (If you prefer a more densely packed crumb, adjust the crumb recipe as follows: 6 tablespoons unsalted butter, 1 cup all purpose flour, 1/2 cup light brown sugar, 2 tablespoons sugar, and 1/4 teaspoon salt.). Set aside. 2. Move oven rack to the center position and preheat oven to 350°F. Grease and flour cake pan. 3. For the cake: In a medium bowl, whisk together flour, cinnamon, baking soda, and salt. Set aside. Whisk together buttermilk and vanilla in a small bowl or measuring cup. Set aside. 4. In a large bowl or the bowl of a stand mixer cream butter and sugar together. Beat in eggs, one at a time, scraping down the sides to fully incorporate each addition. Add half of the flour mixture to the batter, mix on medium to just incorporate, repeat the process adding the buttermilk mixture and the remaining flour. Stir in the mashed bananas until just combined. Pour into 8x8 prepared pan and top with crumbs. Bake until cake is golden brown and a cake tester inserted into the middle comes out clean, about 35 to 40 minutes. Remove from oven to cool. 5. While cake is cooling, quickly whisk together chocolate and cream in a small bowl, then transfer mixture to a pastry bag fitted with a small round tip. Once cake has cooled for about 20 minutes, pipe chocolate in wavy diagonal lines across the surface of the cake—it will take several hours for the chocolate to firm up. Cover and store leftovers up to three days.